… or is it? 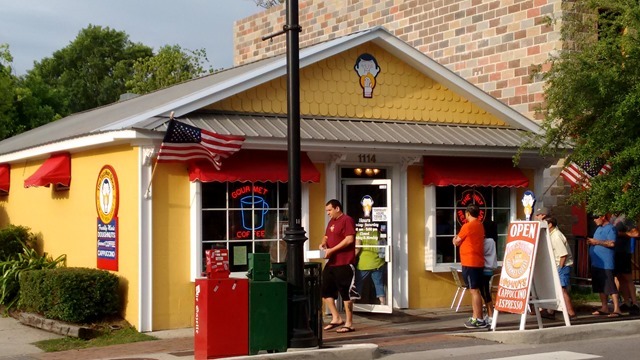 The Tato-Nut Donut Shop in Ocean Springs recently reopened after a fairly long hiatus due to the owner’s back injury. You would think a drastic loss of business might be expected but as the photos below indicate, their customer’s loyalty is second to none. My daily morning walk down Government Street passes the Tato-Nut and it’s always the same. The line is well out the door. This morning I counted 60+ salivating Mississippians waiting patiently for a chance at the deep-fried delights. As I approached the end of the line, I asked if they’re really that good and in the unison worthy of a well trained pod of Sea World dolphin, they smiled, nodded and responded with hearty affirmation. End of the line? No way! This entry was posted on Tuesday, May 26th, 2015 at 5:00 pm and is filed under Uncategorized. You can follow any responses to this entry through the RSS 2.0 feed. You can leave a response, or trackback from your own site. Why didn’t you wait in line to give us a first-hand account of the tasty doughnuts?